Got a couple of hours? Have you ever visited the original Washington Monument? Well, you could just drive up but why??? 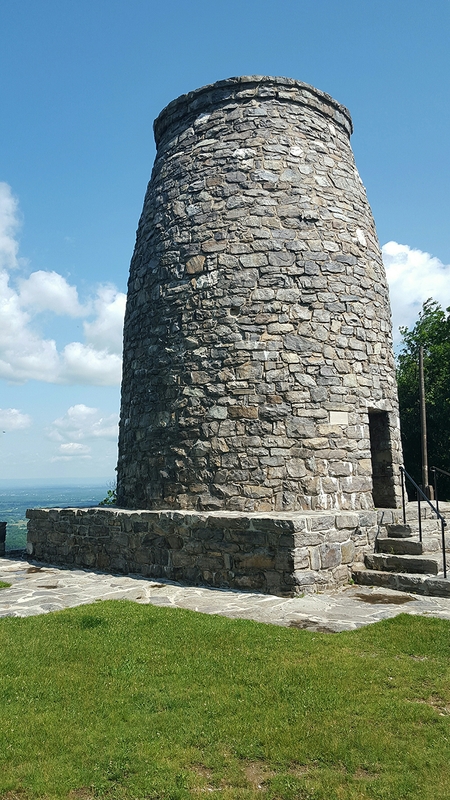 This is a nice out and back hike to the Monument on the Appalachian Trail (AT). Park at the Rt 40 parking lot for the AT (new 40, not the old 40 that goes past South Mountain Inn). Once over the bridge, the AT squeezes between two houses. Respect the boundaries for the AT! Cross the road and continue on the AT as it heads slightly uphill and passes the Bartram Trail. The Bartram Trail links to Greenbrier State Park. 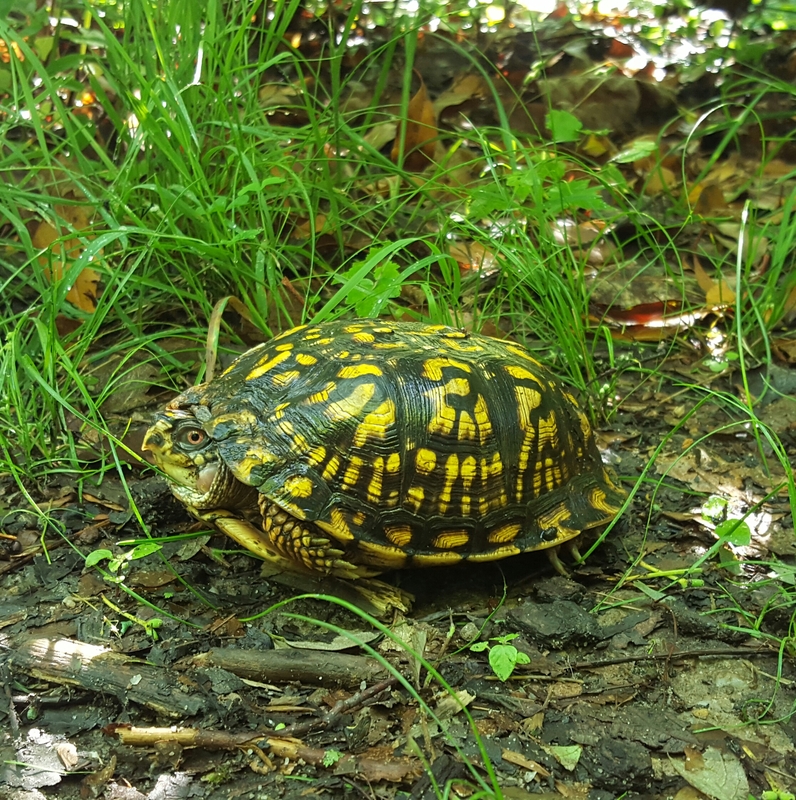 Many animals make their home along the trail, deer, bear, and even turtles! What a cute little girl! If the turtle had red eyes, then it would be a boy. This is also a nice trail for dogs. Sidekick Pauli loves to hikes here! 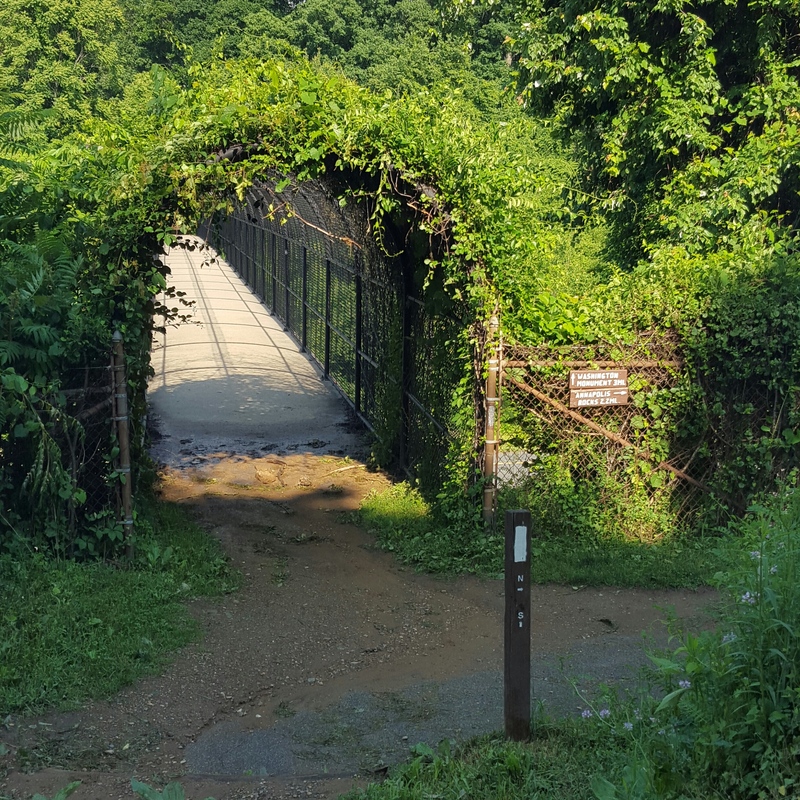 After about a mile, the trail crosses Boonesboro Mountain Road. Be careful! Traffic can come though here pretty fast! The rest of the hike is wooded and shady with two power line crossings. Some of the trail is smooth easy walking while other parts are rocky. Most of the hills are small and increase elevation slowly, that is until you get just past the second powerline crossing. At that point, the trail makes its final climb up to the Washington Monument. The first time I did this hike I packed a picnic lunch and walked the 3.2 miles to the Washington Monument. 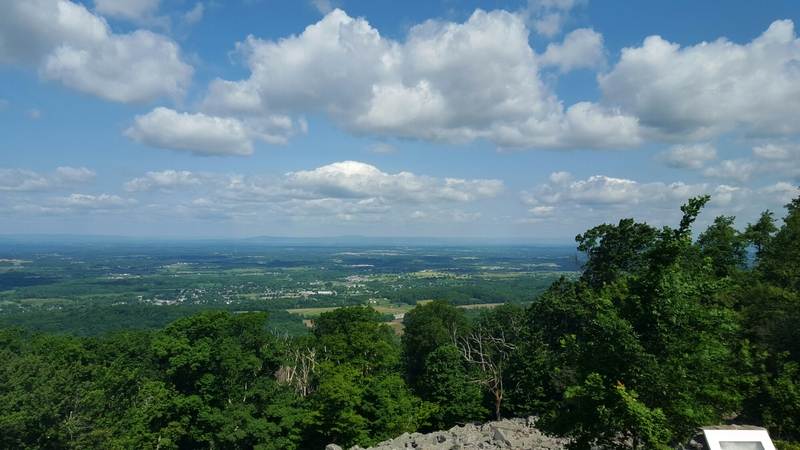 Sitting in the shade of the apple tree, I ate my picnic lunch while taking in the view of the Monument and Boonesboro in the valley below. Then I backtracked 3.2 miles to my car in the Rt. 40 lot. It was very peaceful! This entry was posted in Uncategorized and tagged Appalachian Trail, Appalachian Trail Maryland, Boonesboro Maryland, day hikes near frederick maryland, Hiking, hiking maryland, hiking with dogs, hiking with kids, Washington Monument State Park. Still loving your stories. I’m now the PATC ridgerunner coordinator. Hope to meet you along the trail. Hey! That is fantastic! What section? I’m supervising the six PATC ridgerunners who patrol sections throughout our corridor. I’m having my first meeting with them tomorrow at the Gypsy Spring cabin following an educational event at the Blue Ridge Summit (PA) library. I’ll figure out where I’ll be hiking with them after that. I also have to visit the caretaker at Annapolis Rocks. Sorry, didn’t see coordinator! So, does that include running a section yourself? I’m just the straw boss. 🙂 The biggest complaint I had this spring when I was a volunteer ridgerunner in Georgia was that I never saw my supervision. They needed to see the problems and issues i was seeing in person, not on paper. My plan is to walk a patrol with each of the PATC ridgerunners to both get to know them on the trail, but more importantly see what they see. Thanks to “A Walk in the Woods” movie, we’re expecting a huge increase in thru hike attempts next year, but more importantly the numbers of people who come to the AT just to check it out will probably increase dramatically. Needless to say, hiker culture and Leave No Trace will be foreign concepts to them. Therein lies the problem. I volunteer and maintain my AT section in Shenandoah’s north district. That would seem a but far for you, but we do have people come from a long way. Most of us arrive Friday and camp, work Saturday and eat pot luck, then camp again on Sat. night. I’ll let you know when I’ll be at Annapolis Rocks. Good plan to walk with the ridge runners. We go to SNP quite a bit…not too far! But closer is good too. I will check out the Trail Patrol. Thanks! One awesome section!! I always thought it looked like a milk jug. Hey, super idea on the out and back. I am gonna make some plans to do just that. Thanks! Yes! A milk jug, haha! Another benefit to stopping for a picnic is that there are bathrooms right down the hill. 🙂 Have fun! Excellent posting! And lovely picture of the turtle, too. I just read about this monument yesterday in an AT memoir I’m reading, but couldn’t really visualize it. Thank you for the post and the photos!